Deer mating season in Missouri is typically between the months of October and December, which means they will be more active and dangerous when you are driving. With the rut coming up (a three-week long time frame where bucks are notoriously active and reckless), we need to keep our eyes peeled for deer running onto the roads. We’ve all seen the aftermath of a collision with a deer, and the damage they can do to a vehicle is alarming. However, if you do see a deer in front of you, do your best not to swerve – this can be even more dangerous than hitting the deer. The combination of cooler temperatures and rain make for very hazardous roads. 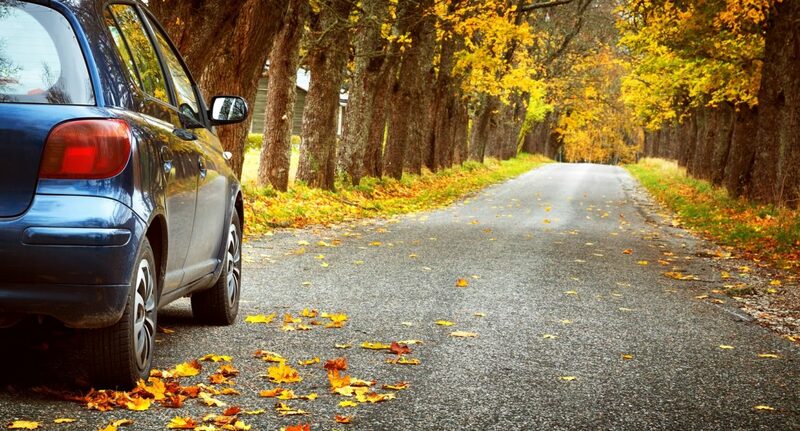 In fact, wet leaves can be just as slippery for cars as ice is! Take sharp turns at a slower speed, and be sure to use caution on windy roads. Nighttime creeps up on us earlier and earlier in the fall – which means we must drive in the dark more. This increases the chances of accidents, so always utilize your headlights when you notice the sun starting to go down. Use your high-beams as much as possible as well, but only when no other driver is coming your way. Everyone is back in school, which means traffic can be absolutely terrible right before school starts and right after school ends. Watch out for school zones and crosswalks, as there will be more pedestrians out and about in these areas. Always obey school zone laws and signs when passing through. As always, pay attention to when your car should need its regular maintenance and oil changes. Staying up-to-date on these will cut down on your chances of breaking down and getting into accidents, along with being aware of the hazards we talked about. While we’d love it if no one ever got into accidents, it does happen – and that’s why you should have a lawyer you can trust. You know what to do, call Tad Morlan.